Here's where I falter in my resolve. Sitting at a desk, staring at my computer, 3pm comes along like a punch to the face. I am suddenly starving, no matter what I've put in my body up until that point. It could be the most perfectly balanced, nutritionally packed day - a nutritionist's dream blend of leafy greens, lean proteins and satisfying spices. 3pm hits and my hand disconnects from my rational mind and becomes a demon-posessed ravenous banshee. I want to grab something and I no longer care what that something is. Enter the glowing jewels that are my beloved juice bottles. I love juicing. I love the taste, the smell, the way the bottles look lined up in their brightly colored rows in my fridge. My poor, abused digestive system loves not having to work so hard (yes, I am referring to digestion) to get access to the nutrients packed inside all those luscious, leafy greens. There's no lettuce in your teeth. No worrying about what that restaurant hid in your salad (bacon? cheese? 5 tbsps of olive oil?) You know packed into that portable container is a farmer's market bounty, cold-pressed at the peak of their nutritional yield and waiting to bath my cells in antioxidants. But of course, the direct, IV-like juice approach to nutrients takes out the fiber from the veggies and fruits, aka the things that make you feel full. Knowing I have a full meal waiting for me at the end of the day keeps me from irrational hunger. The juices are crisp and delicious. Plus they satisfy the "hand to mouth" urge that derails the perennially snackers like me. But psychologically, the hollow bellied feeling of a day of liquids is enough to sway even the most motivated health enthusiast. And that's where the Slimfast approach comes into play. 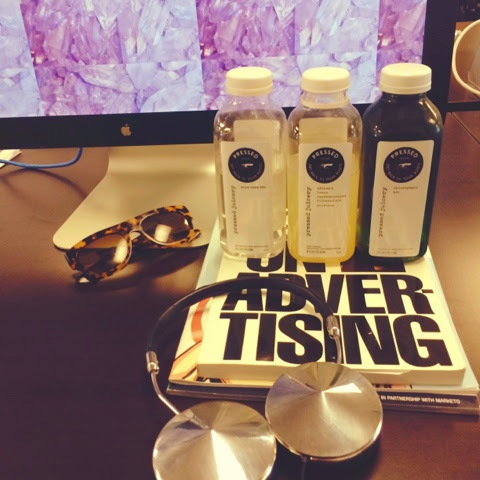 "Two shakes a day, plus a sensible dinner"
That's my approach to juice cleansing. I get one meal (usually a lean protein like salmon or skinless chicken, plus a gluten-free carb like rice and a big, colorful salad) and then the rest of the day I juice. It's infinitely better than the days I'm lured into french fries for lunch and candy for snacks - the "convenient" foods that leave me feeling unsatisfied, cranky and dried out by days end. If by midday the juice isn't hitting the spot, I'll have that sensible meal for lunch. To use a start-up word, the plan is "extensible" - it works no matter what your schedule throws your way. (not to mention their convenient delivery options.) Their seasonal flavors are particularly out-of-this world (yesterday I had a jalapeno kale drink that rocked my world) and their classics are the perfect blends of nutrients and flavor.